Do you want to double your site's speed? I have a lot of great news to cover in this post, but the main highlight is the compatibility with PHP 7 because of the significant performance improvements it offers over PHP 5.6. We also have a new module for Joomla and widget for WordPress, shortcodes functionality, enhanced custom fields functionality, new features for UserProfiles and more! The latest release of JReviews 2.7.11.2 makes it compatible with PHP7. This is amazing news because PHP 7 is up to twice as fast than PHP 5.6 and also uses significantly less memory. Upgrading JReviews can be done in a few simple steps and we've outlined those for you in the Upgrading JReviews from a PHP 5 server to PHP 7 article in the documentation. What are you waiting for? Give your site a huge performance boost! In addition to the modules in Joomla and widgets in WordPress, now you can use shortcodes to embed information in different areas of your site. The shortcodes are fully customizable just like their module/widget counterparts. To start taking advantage of this new feature check out the Shortcodes documentation for examples and the list of attributes you can use to customize the output. Many JReviews sites take advantage of the ease of use and SEO features in JReviews to power their site's news and blog sections. 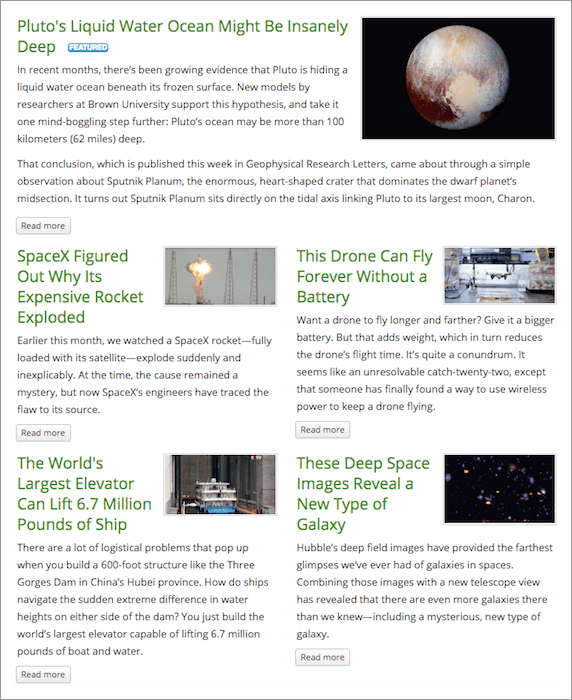 And now you can take advantage of the new Magazine layout for these sections. You can configure the number of leading articles and the number of intro articles, as well as the number of columns. For more information on how to get started with this new layout, read the magazine layout documentation article. Joomla login module and WordPress login widget with horizontal and vertical layouts. It also reminds users to create their public profile. 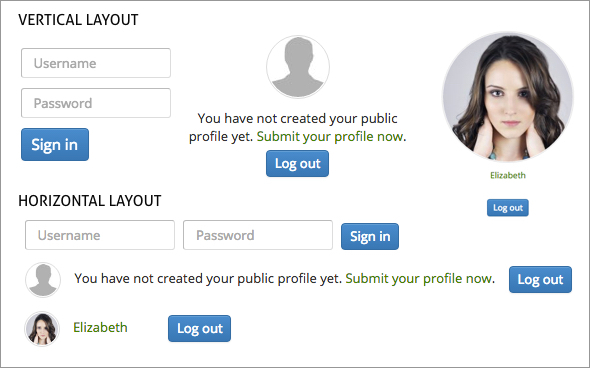 Create Profile Types and let users choose their account type when they register. Each profile type can be associated with user groups so users are automatically assigned to those groups when their accounts are created. Require users to agree to the site's Terms of Service to register on the site. Hide "Name" input from the registration form to simplify it and have it automatically populate with the username. In addition to being able to display a complete list of your site's reviewers by rank in a complete page, you can now also take advantage of the new Reviewer Rank Joomla module and WordPress Widget to display the top N reviewers anywhere on the site. Once you upgrade to the latest version you'll find the module in the Joomla module manager and the widget in the WordPress Widgets page. If you use the GeoMaps Add-on you'll be able to take advantage of two new location-based modes for the Listings module/widget. It's now possible ti display listings around a custom center location which you specify using coordinates or through geo-targeting using the current user's IP address to determine his location. The new modes are called "Proximity Custom Center" and "Proximity Geotargeting" and you can also specify the radius in the settings. We've got two great new features for custom fields to enhance form functionality. You'll find the new settings when you create or edit a custom field. Option selection limit: sometimes you want to limit the number of options that can be selected for checkboxes, multiple select, and related listing custom fields. Now it's possible to do this through a new field setting which lets you specify different limits for different fields. Not only that but if you use the PaidListings Add-on you can also raise or remove the limit through paid plans and upgrades. Descriptions inside inputs: it's already possible to display a field description as a tooltip, below or above a custom field. However, if you want to streamline your forms, you can now also set the description to display inside the field input for text-based custom fields. Considering the number of scripts that I have evaluated, I am mightly impressed by the care and interest the JReviews takes in promoting its products and ultimately its users. Kudos! Thank you! I truly appreciate the feedback and we'll continue to do our best.